We have been catering to the wide needs of our fashion conscious clients by offering an enticing range of Mink Blankets that gives good comfort and excellent warmth. These are designed by our artisans using supreme grade fabrics and latest techniques keeping in mind the ongoing fashion trends. 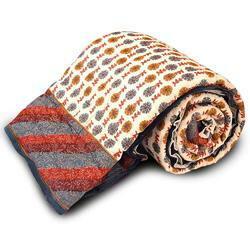 To ensure their flawlessness, these blankets are tested on various parameters by our quality controllers. 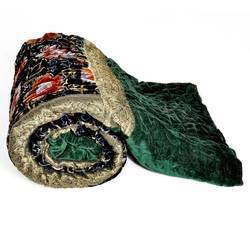 Offered Mink Blankets are available in various vibrant colors, sizes and patterns. 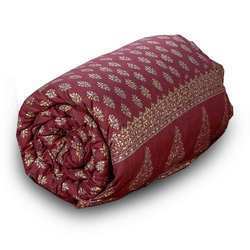 This famous Jaipuri Single Bed AC Comforter is richly hued in resplendent brick red tone, compliment with stunning, handblock prints of traditional florals motifs with sumptuous golden booty prints. The smart floral prints on the border gives it a splendid traditional look. An inviting way to bring warmth and luxury to the bed, this Jaipuri light weight comforter is made entirely of cotton. World famous Jaipuri Pure Cotton Single Bed Comforter (also populary called as Dohar) in traditional Sanganeri Hand Block Print of Rajasthan. These comforters has a 3-layered cover with fluffy middle layer of High Grade Flannel sheet between two layers of cotton fabric. Being light weight, these are ideal during travelling. Jaipuri Comforters are characterized by their incredible feather-weight lightness, softness and warmth. These good looking fluffy Dohars are a specialty of Jaipur. Inspired by traditional Rajasthani print the beautiful floral pattern Jaipuri Single Bed AC Comforter will refresh you when you wake up and calm you when you're ready for bed. The handcrafted Comforter feature an eclectic mix of vintage floral, Indian paisleys and booty prints all hued in cheerful brick red color on white base to enliven any room in an instant. 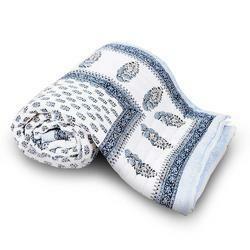 The border is printed with traditional Sanganeri booty prints which gives it an exclusive classy look. Splashy florals mingle with traditional Indian block prints on this extraordinary Single Bed Quilt, creating an exuberant layer for the bed. Guaranteed to brighten up even the darkest days of winter, this Little India handmade quilt is framed with floral gold prints and floral border and reverses to solid plain purple. 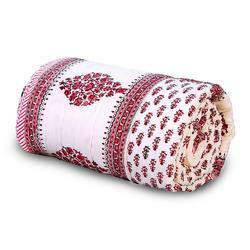 The quilt is crafted by hand of pure cotton, which has been washed for lived-in softness. Soothing colors and scrolling florals give our Little India Single Bed Quilt its serene elegance. Rendered in tranquil shades of turquoise, pale blue on white base, this beautiful handmade quilt is finished with booti prints on the edges for a hint of vintage charm. Hand-quilted of pure cotton that’s been washed for lived-in softness, our Jaipuri work quilt lends an elegant look to any bedroom. This is a Seductive world famous luxurious Korean Mink Double Bed Blanket which comes in soothing coffee brown color and vibrant embossed style, is the best addition to your bedroom essentials. Mink Blankets are characterized by their incredible feather-weight lightness, softness and warmth. This coffee Brown embossed blanket is made from high quality fine acrylic micro fiber which enables warmth even in extreme cold.These blankets are thick and plush yet light in weight. They provide maximum comfort and can be easily carried during travel. The higher piles lend a better cushioning effect and enhance comfort. They do not shed and would last for years. They can be machine washed any number of times. The typical make-up of a mink blanket is 85% acrylic and 15% polyester. The acrylic supplies the softness while the polyester keeps the mink blanket from wrinkling. The product has been manufactured in India with modern South Korean machines and technology. This world famous luxurious Korean Mink Blanket in soothing color and vibrant Floral print is the best addition to your bedroom essentials. Mink Blankets are characterized by their incredible feather-weight lightness, softness and warmth. This Maroon blanket is made from high quality fine acrylic fiber which enables warmth even in extreme cold. These blankets are thick and plush yet light in weight. They provide maximum comfort and can be easily carried during travel. The higher piles lend a better cushioning effect and enhance comfort. They do not shed and would last for years. They can be machine washed any number of times. The typical make-up of a mink blanket is 85% acrylic and 15% polyester. The acrylic supplies the softness while the polyester keeps the mink blanket from wrinkling. The product has been manufactured in India with modern South Korean machines and technology. 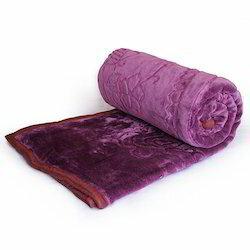 This world famous luxurious Korean Mink Double Bed Blanket that comes in lavishing purple color and also in vibrant embossed style, is the best addition to your bedroom essentials. Mink Blankets are characterized by their incredible feather-weight lightness, softness and warmth. 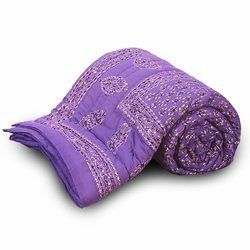 This beautiful purple color embossed blanket is made from high quality fine acrylic micro fiber which enables warmth even in extreme cold. These blankets are thick and plush yet light in weight. They provide maximum comfort and can be easily carried during travel. The higher piles lend a better cushioning effect and enhance comfort. They do not shed and would last for years. They can be machine washed any number of times. The typical make-up of a mink blanket is 85% acrylic and 15% polyester. The acrylic supplies the softness while the polyester keeps the mink blanket from wrinkling. The product has been manufactured in India with modern South Korean machines and technology. This world famous luxurious Korean Mink Double Bed Blanket comes in soothing golden brown color and vibrant embossed style, is the best addition to your bedroom essentials. Mink Blankets are characterized by their incredible feather-weight lightness, softness and warmth. This golden Brown embossed blanket is made from high quality fine acrylic micro fiber which enables warmth even in extreme cold. These blankets are thick and plush yet light in weight. They provide maximum comfort and can be easily carried during travel. The higher piles lend a better cushioning effect and enhance comfort. They do not shed and would last for years. They can be machine washed any number of times. The typical make-up of a mink blanket is 85% acrylic and 15% polyester. The acrylic supplies the softness while the polyester keeps the mink blanket from wrinkling. The product has been manufactured in India with modern South Korean machines and technology. This cosy feeling Korean Mink Double Bed Blanket comes in soothing pink color and vibrant embossed style, is the best addition to your bedroom essentials. Mink Blankets are characterized by their incredible feather-weight lightness, softness and warmth. This pink embossed blanket is made from high quality fine acrylic micro fiber which enables warmth even in extreme cold.These blankets are thick and plush yet light in weight. They provide maximum comfort and can be easily carried during travel. The higher piles lend a better cushioning effect and enhance comfort. They do not shed and would last for years. They can be machine washed any number of times. The typical make-up of a mink blanket is 85% acrylic and 15% polyester. The acrylic supplies the softness while the polyester keeps the mink blanket from wrinkling. The product has been manufactured in India with modern South Korean machines and technology. This world famous luxurious Korean Mink Double Bed Blanket comes in soothing maroon color and vibrant embossed style, is the best addition to your bedroom essentials. Mink Blankets are characterized by their incredible feather-weight lightness, softness and warmth. This maroon embossed style blanket is made from high quality fine acrylic micro fiber which enables warmth even in extreme cold.These blankets are thick and plush yet light in weight. They provide maximum comfort and can be easily carried during travel. The higher piles lend a better cushioning effect and enhance comfort. They do not shed and would last for years. They can be machine washed any number of times. The typical make-up of a mink blanket is 85% acrylic and 15% polyester. The acrylic supplies the softness while the polyester keeps the mink blanket from wrinkling. The product has been manufactured in India with modern South Korean machines and technology. This Jaipuri luxurious Korean Mink Double Bed Blanket is ideal for different modern and traditional decor that comes in soothing maroon color and vibrant embossed style, is the best addition to your bedroom essentials. Mink Blankets are characterized by their incredible feather-weight lightness, softness and warmth. This maroon embossed blanket is made from high quality fine acrylic micro fiber which enables warmth even in extreme cold. These blankets are thick and plush yet light in weight. They provide maximum comfort and can be easily carried during travel. The higher piles lend a better cushioning effect and enhance comfort. They do not shed and would last for years. They can be machine washed any number of times. The typical make-up of a mink blanket is 85% acrylic and 15% polyester. The acrylic supplies the softness while the polyester keeps the mink blanket from wrinkling. The product has been manufactured in India with modern South Korean machines and technology. 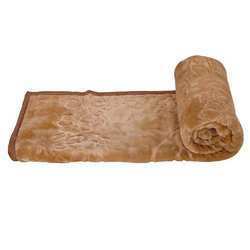 This is a Seductive world famous luxurious Korean Mink Double Bed Blanket which comes in soothing camel brown color and vibrant Floral embossed style, is the best addition to your bedroom essentials. Mink Blankets are characterized by their incredible feather-weight lightness, softness and warmth. This camel Brown embossed blanket is made from high quality fine acrylic micro fiber which enables warmth even in extreme cold.These blankets are thick and plush yet light in weight. They provide maximum comfort and can be easily carried during travel. The higher piles lend a better cushioning effect and enhance comfort. They do not shed and would last for years. They can be machine washed any number of times. The typical make-up of a mink blanket is 85% acrylic and 15% polyester. The acrylic supplies the softness while the polyester keeps the mink blanket from wrinkling. The product has been manufactured in India with modern South Korean machines and technology. This stylish Korean Mink Double Bed Blanket is ideal for different modern and traditional decor that comes in exotic Red color and vibrant floral print, is the best addition to your bedroom essentials. Mink Blankets are characterized by their incredible feather-weight lightness, softness and warmth. 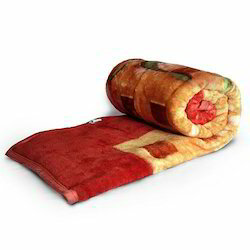 This Red color blanket is made from high quality fine acrylic micro fiber which enables warmth even in extreme cold. These blankets are thick and plush yet light in weight. They provide maximum comfort and can be easily carried during travel. The higher piles lend a better cushioning effect and enhance comfort. They do not shed and would last for years. They can be machine washed any number of times. The typical make-up of a mink blanket is 85% acrylic and 15% polyester. The acrylic supplies the softness while the polyester keeps the mink blanket from wrinkling. The product has been manufactured in India with modern South Korean machines and technology. This cosy feel Mink Double Bed Blanket is ideal for different modern and traditional decor that comes in dark brown color and vibrant floral print, is the best addition to your bedroom essentials. Mink Blankets are characterized by their incredible feather-weight lightness, softness and warmth. 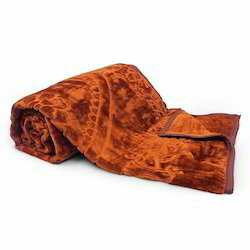 This dark brown color blanket is made from high quality fine acrylic micro fiber which enables warmth even in extreme cold. These blankets are thick and plush yet light in weight. They provide maximum comfort and can be easily carried during travel. The higher piles lend a better cushioning effect and enhance comfort. They do not shed and would last for years. They can be machine washed any number of times. The typical make-up of a mink blanket is 85% acrylic and 15% polyester. The acrylic supplies the softness while the polyester keeps the mink blanket from wrinkling. The product has been manufactured in India with modern South Korean machines and technology. 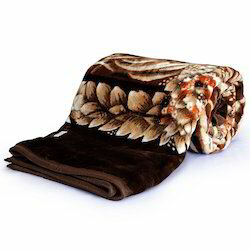 This designer comfortable Korean Mink Double Bed Blanket is ideal for different modern and traditional decor that comes in soothing coffee brown color and vibrant floral print, is the best addition to your bedroom essentials. Mink Blankets are characterized by their incredible feather-weight lightness, softness and warmth. This cute coffee brown color blanket is made from high quality fine acrylic micro fiber which enables warmth even in extreme cold. These blankets are thick and plush yet light in weight. They provide maximum comfort and can be easily carried during travel. The higher piles lend a better cushioning effect and enhance comfort. They do not shed and would last for years. They can be machine washed any number of times. The typical make-up of a mink blanket is 85% acrylic and 15% polyester. The acrylic supplies the softness while the polyester keeps the mink blanket from wrinkling. The product has been manufactured in India with modern South Korean machines and technology. This Jaipuri luxurious Korean Mink Double Bed Blanket is ideal for different modern and traditional decor that comes in exotic Red color and vibrant floral print, is the best addition to your bedroom essentials. Mink Blankets are characterized by their incredible feather-weight lightness, softness and warmth. 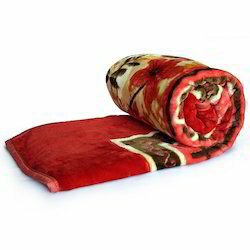 This Red color blanket is made from high quality fine acrylic micro fiber which enables warmth even in extreme cold. These blankets are thick and plush yet light in weight. They provide maximum comfort and can be easily carried during travel. The higher piles lend a better cushioning effect and enhance comfort. They do not shed and would last for years. They can be machine washed any number of times. The typical make-up of a mink blanket is 85% acrylic and 15% polyester. The acrylic supplies the softness while the polyester keeps the mink blanket from wrinkling. The product has been manufactured in India with modern South Korean machines and technology. This Jaipuri luxurious Korean Mink Double Bed Blanket is ideal for different modern and traditional decor that comes in dark brown color and vibrant floral print, is the best addition to your bedroom essentials. Mink Blankets are characterized by their incredible feather-weight lightness, softness and warmth. 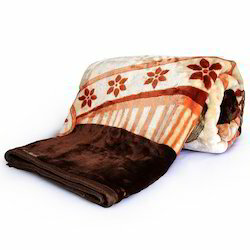 This brown blanket is made from high quality fine acrylic micro fiber which enables warmth even in extreme cold. These blankets are thick and plush yet light in weight. They provide maximum comfort and can be easily carried during travel. The higher piles lend a better cushioning effect and enhance comfort. They do not shed and would last for years. They can be machine washed any number of times. The typical make-up of a mink blanket is 85% acrylic and 15% polyester. The acrylic supplies the softness while the polyester keeps the mink blanket from wrinkling. The product has been manufactured in India with modern South Korean machines and technology. This beautiful Jaipuri luxurious Korean Mink Double Bed Blanket is ideal for different modern and traditional decor that comes in exotic Red color and vibrant floral print, is the best addition to your bedroom essentials. Mink Blankets are characterized by their incredible feather-weight lightness, softness and warmth. 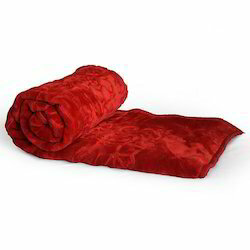 This Red color blanket is made from high quality fine acrylic micro fiber which enables warmth even in extreme cold. These blankets are thick and plush yet light in weight. They provide maximum comfort and can be easily carried during travel. The higher piles lend a better cushioning effect and enhance comfort. They do not shed and would last for years. They can be machine washed any number of times. The typical make-up of a mink blanket is 85% acrylic and 15% polyester. The acrylic supplies the softness while the polyester keeps the mink blanket from wrinkling. The product has been manufactured in India with modern South Korean machines and technology. This Jaipuri luxurious Korean Mink Double Bed Blanket is ideal for different modern and traditional decor that comes in dark brown color and vibrant floral print, is the best addition to your bedroom essentials. Mink Blankets are characterized by their incredible feather-weight lightness, softness and warmth. 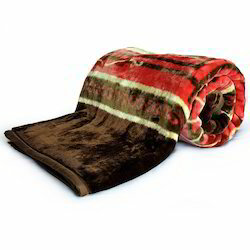 This dark brown color blanket is made from high quality fine acrylic micro fiber which enables warmth even in extreme cold. 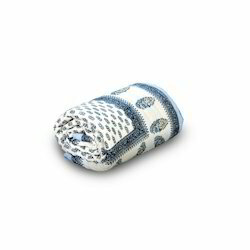 These blankets are thick and plush yet light in weight. They provide maximum comfort and can be easily carried during travel. The higher piles lend a better cushioning effect and enhance comfort. They do not shed and would last for years. They can be machine washed any number of times. The typical make-up of a mink blanket is 85% acrylic and 15% polyester. The acrylic supplies the softness while the polyester keeps the mink blanket from wrinkling. The product has been manufactured in India with modern South Korean machines and technology. This supersoft Korean Mink Double Bed Blanket is ideal for different modern and traditional decor that comes in exotic Red color and vibrant floral print, is the best addition to your bedroom essentials. Mink Blankets are characterized by their incredible feather-weight lightness, softness and warmth. 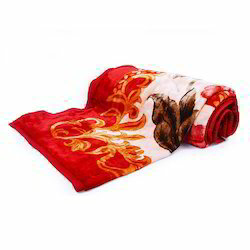 This Red color floral print blanket is made from high quality fine acrylic micro fiber which enables warmth even in extreme cold. These blankets are thick and plush yet light in weight. They provide maximum comfort and can be easily carried during travel. The higher piles lend a better cushioning effect and enhance comfort. They do not shed and would last for years. They can be machine washed any number of times. The typical make-up of a mink blanket is 85% acrylic and 15% polyester. The acrylic supplies the softness while the polyester keeps the mink blanket from wrinkling. The product has been manufactured in India with modern South Korean machines and technology. This world famous luxurious Korean Mink Blanket in soothing color and embossed styl is the best addition to your bedroom essentials. Mink Blankets are characterized by their incredible feather-weight lightness, softness and warmth. 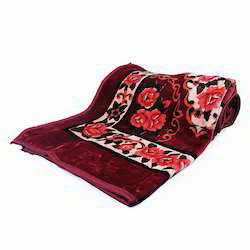 This Red color blanket is made from high quality fine acrylic fiber which enables warmth even in extreme cold. These blankets are thick and plush yet light in weight. They provide maximum comfort and can be easily carried during travel. The higher piles lend a better cushioning effect and enhance comfort. They do not shed and would last for years. They can be machine washed any number of times. The typical make-up of a mink blanket is 85% acrylic and 15% polyester. The acrylic supplies the softness while the polyester keeps the mink blanket from wrinkling. The product has been manufactured in India with modern South Korean machines and technology. This world famous luxurious Korean Mink Blanket in soothing color and embossed style is the best addition to your bedroom essentials. Mink Blankets are characterized by their incredible feather-weight lightness, softness and warmth. 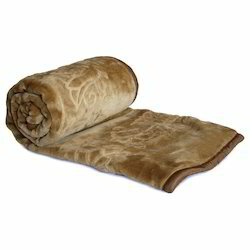 This Camel Brown blanket is made from high quality fine acrylic fiber which enables warmth even in extreme cold. These blankets are thick and plush yet light in weight. They provide maximum comfort and can be easily carried during travel. The higher piles lend a better cushioning effect and enhance comfort. They do not shed and would last for years. They can be machine washed any number of times. The typical make-up of a mink blanket is 85% acrylic and 15% polyester. The acrylic supplies the softness while the polyester keeps the mink blanket from wrinkling. The product has been manufactured in India with modern South Korean machines and technology. 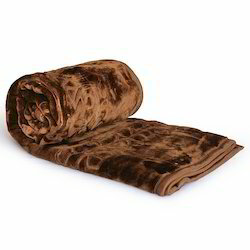 This world famous luxurious Korean Mink Blanket in soothing tan brown color and embossed style is the best addition to your bedroom essentials. Mink Blankets are characterized by their incredible feather-weight lightness, softness and warmth. 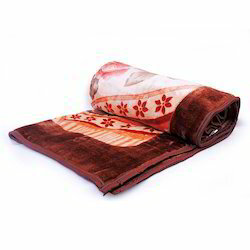 This Tan Brown embossed blanket is made from high quality fine acrylic fiber which enables warmth even in extreme cold.. These blankets are thick and plush yet light in weight. They provide maximum comfort and can be easily carried during travel. The higher piles lend a better cushioning effect and enhance comfort. They do not shed and would last for years. They can be machine washed any number of times. The typical make-up of a mink blanket is 85% acrylic and 15% polyester. The acrylic supplies the softness while the polyester keeps the mink blanket from wrinkling. The product has been manufactured in India with modern South Korean machines and technology. This world famous luxurious Korean Mink embossed Blanket in soothing color is the best addition to your bedroom essentials. Mink Blankets are characterized by their incredible feather-weight lightness, softness and warmth. This Brick Red Color embossed blanket is made from high quality fine acrylic fiber which enables warmth even in extreme cold. These blankets are thick and plush yet light in weight. They provide maximum comfort and can be easily carried during travel. The higher piles lend a better cushioning effect and enhance comfort. They do not shed and would last for years. They can be machine washed any number of times. The typical make-up of a mink blanket is 85% acrylic and 15% polyester. The acrylic supplies the softness while the polyester keeps the mink blanket from wrinkling. The product has been manufactured in India with modern South Korean machines and technology. This world famous luxurious embossed Korean Mink Blanket in soothing color is the best addition to your bedroom essentials. Mink Blankets are characterized by their incredible feather-weight lightness, softness and warmth. This Camel Brown color embossed blanket is made from high quality fine acrylic fiber which enables warmth even in extreme cold. These blankets are thick and plush yet light in weight. They provide maximum comfort and can be easily carried during travel. The higher piles lend a better cushioning effect and enhance comfort. They do not shed and would last for years. They can be machine washed any number of times. The typical make-up of a mink blanket is 85% acrylic and 15% polyester. The acrylic supplies the softness while the polyester keeps the mink blanket from wrinkling. The product has been manufactured in India with modern South Korean machines and technology. This world famous luxurious Korean Mink Blanket in soothing color is the best addition to your bedroom essentials. Mink Blankets are characterized by their incredible feather-weight lightness, softness and warmth. This Maroon embossed blanket is made from high quality fine acrylic fiber which enables warmth even in extreme cold. These blankets are thick and plush yet light in weight. They provide maximum comfort and can be easily carried during travel. The higher piles lend a better cushioning effect and enhance comfort. They do not shed and would last for years. They can be machine washed any number of times. The typical make-up of a mink blanket is 85% acrylic and 15% polyester. The acrylic supplies the softness while the polyester keeps the mink blanket from wrinkling. The product has been manufactured in India with modern South Korean machines and technology. This world famous luxurious Korean Mink Blanket in soothing color is the best addition to your bedroom essentials. Mink Blankets are characterized by their incredible feather-weight lightness, softness and warmth. This Red embossed blanket is made from high quality fine acrylic fiber which enables warmth even in extreme cold. These blankets are thick and plush yet light in weight. They provide maximum comfort and can be easily carried during travel. The higher piles lend a better cushioning effect and enhance comfort. They do not shed and would last for years. They can be machine washed any number of times. The typical make-up of a mink blanket is 85% acrylic and 15% polyester. The acrylic supplies the softness while the polyester keeps the mink blanket from wrinkling. The product has been manufactured in India with modern South Korean machines and technology. This world famous luxurious Korean Mink Blanket in soothing color and vibrant floral print is the best addition to your bedroom essentials. 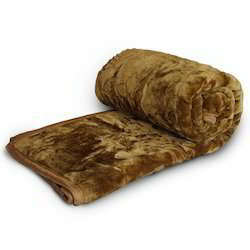 Mink Blankets are characterized by their incredible feather-weight lightness, softness and warmth. 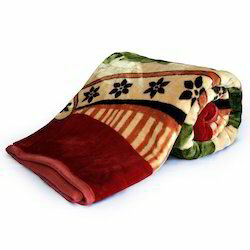 This Red color blanket is made from high quality fine acrylic fiber which enables warmth even in extreme cold. These blankets are thick and plush yet light in weight. They provide maximum comfort and can be easily carried during travel. The higher piles lend a better cushioning effect and enhance comfort. They do not shed and would last for years. They can be machine washed any number of times. The typical make-up of a mink blanket is 85% acrylic and 15% polyester. The acrylic supplies the softness while the polyester keeps the mink blanket from wrinkling. The product has been manufactured in India with modern South Korean machines and technology. This world famous luxurious Korean Mink Blanket in soothing color and vibrant floral print is the best addition to your bedroom essentials. Mink Blankets are characterized by their incredible feather-weight lightness, softness and warmth. 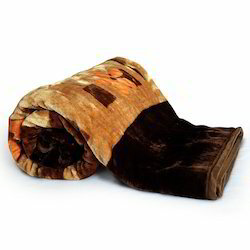 This Golden Brown blanket is made from high quality fine acrylic fiber which enables warmth even in extreme cold. These blankets are thick and plush yet light in weight. They provide maximum comfort and can be easily carried during travel. The higher piles lend a better cushioning effect and enhance comfort. They do not shed and would last for years. They can be machine washed any number of times. The typical make-up of a mink blanket is 85% acrylic and 15% polyester. The acrylic supplies the softness while the polyester keeps the mink blanket from wrinkling. The product has been manufactured in India with modern South Korean machines and technology. 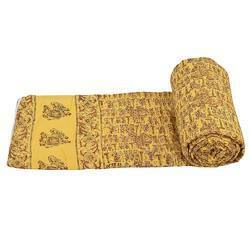 Pattern Prints of Indian Maharaja procession comprising the motifs of elepahts and horses. A royal print, comprising of the king riding atop his richly caparisoned elephant accompanied with his rich army on horses, rendered on creamy yellow base, with brick red and gold print will be a jewel in your bedroom. This exclusive Jaipuri single bed AC Comforter comes with traditional handblock golden floral print on the border that compliments well with this Little India handmade comforter, designed to chase away winter blues and chills. Color and comfort at its best. An exotic mix of golden booty prints, paisleys, and florals motifs give our Little India cotton handblock print Single Bed AC Comforter its global-chic appeal. Distinctive and dramatic in bold carrot red base, golden and blacks, the beautiful Jaipuri comforter offers exquisite room-defining beauty to any bedroom in your home, from the master suite to the guestroom. made by hand and bordered in floral pattern for a classic finish, the 100% cotton Jaipuri comforter work equally well in contemporary as traditional home settings. Pattern Traditional mix of floral motifs and sanganeri booty prints. This flower-splashed Little India Single Bed AC Comforter is so charming and stylish, it's sure to liven up any space in your home. Traditional mix of floral motifs and sanganeri booty prints on white base interspersed with exclusive designer border and handmade into a marvelous and cheerful work of art for the bed. 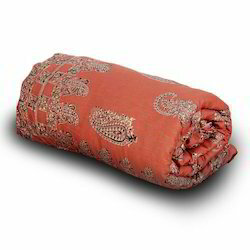 World famous Jaipuri Pure Cotton Single Bed Comforter (also populary called as Dohar) in traditional Sanganeri Hand Block Print of Rajasthan. These comforters has a 3-layered cover with fluffy middle layer of High Grade Flannel sheet between two layers of cotton fabric. Being light weight, these are ideal during travelling. 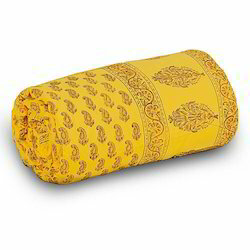 Jaipuri Comforters are characterized by their incredible feather-weight lightness, softness and warmth. These good looking fluffy Dohars are a specialty of Jaipur. This admiring Jaipuri single bed AC Comforter is embellished with colourful floral motifs on yellow base. It is graced with latest Sanganeri booty prints all over to give an ethnic yet modern glance from the house of Little India. It’s time to add a little floral charisma to your bedroom setting with this floral printed designer comforter. Richly hued in resplendent yellow tone, this stunning, handcrafted comforter mixes vintage florals with sumptuous golden booty prints. The smart floral prints on the border gives it a splendid traditional look. World famous Jaipuri Pure Cotton Single Bed Comforter (also populary called as Dohar) in traditional Sanganeri Hand Block Print of Rajasthan. These comforters has a 3-layered cover with fluffy middle layer of High Grade Flannel sheet between two layers of cotton fabric. Being light weight, these are ideal during travelling. Jaipuri Comforters are characterized by their incredible feather-weight lightness, softness and warmth. These good looking fluffy Dohars are a specialty of Jaipur. This stunning Little India single bed AC Comforter comprises the intricate floral booty patterns inspired by Rajasthani tradition gives it a global recognition. Beautiful floral pattern printed in torquoise and black on white base gives it an exclusive look, with a coordinating designer zig zag border, printed for an impeccably crafted look and feel. One World famous Jaipuri Single Bed Cotton Razai (Quilt) in traditional Sanganeri Hand Block Floral Gold print of Rajasthan. These good looking, fluffy, hand-made Indian Razai or quilts are a specialty of Jaipur. This Jaipuri single bed velvet razai (Quilt) of Rajasthan in floral pattern is world famous for its warmth. The dark green shade of this quilt makes it look dirt free for years and also gives it an appealing look. The hard working craftsmen and women engaged their creative mind to give it a finishing look. It is double hand stitched for better holding of velvet sheet and cotton filling. Inspired by traditional Rajasthani print the beautiful floral pattern Single Bed AC Comforter will refresh you when you wake up and calm you when you're ready for bed. The handcrafted Jaipuri comforter feature an eclectic mix of vintage floral, Indian paisleys and booty prints all hued in cheerful brick brown color on white base to enliven any room in an instant. The border is printed with traditional Sanganeri booty prints which gives it an exclusive classy look. Being light weight, these are ideal during travelling. Jaipuri Comforters are characterized by their incredible feather-weight lightness, softness and warmth. This stunning handmade Single Bed AC comforter combines spontaneous floral pattern in black and golden color on beautiful purple base to create a gorgeous comfort in winter. Assembled from traditional Jaipuri prints—from booty prints and scrolling florals to petite block-print fancy border—it is made by master artisans of Jaipur. 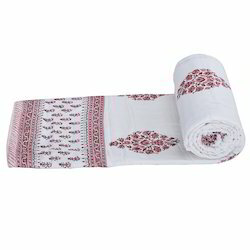 World famous Jaipuri Pure Cotton Single Bed Comforter (also populary called as Dohar) in traditional Sanganeri Hand Block Print of Rajasthan. These comforters has a 3-layered cover with fluffy middle layer of High Grade Flannel sheet between two layers of cotton fabric. Being light weight, these are ideal during travelling. Jaipuri Comforters are characterized by their incredible feather-weight lightness, softness and warmth. These good looking fluffy Dohars are a specialty of Jaipur. This light weight yet very warm Jaipuri Single Bed AC Comforter from Little India features a beautiful botanical inspired floral pattern that comes to life in soothing hues of brown on white base. 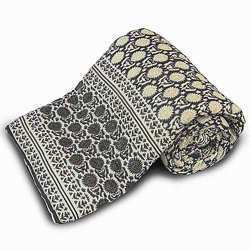 This original design is made from famous sanganeri handblock floral motif prints and bordered with stylish zig-zag pattern that adds style to it. 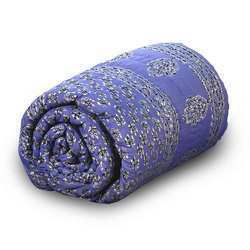 World famous Jaipuri Pure Cotton Single Bed Comforter (also populary called as Dohar) in traditional Sanganeri Hand Block Print of Rajasthan. These comforters has a 3-layered cover with fluffy middle layer of High Grade Flannel sheet between two layers of cotton fabric. Being light weight, these are ideal during travelling. Jaipuri Comforters are characterized by their incredible feather-weight lightness, softness and warmth. These good looking fluffy Dohars are a specialty of Jaipur.